Driving 30 minutes (21 miles) outside the city of Chiang Mai went by fast as Mr. Pop, owner of Lanna Kingdom Elephant Sanctuary, engaged in conversation with us, in perfect English. After being a monk for five years and running a tour company, he opened this sanctuary. It has been open for six months when we arrive, and he has rescued a total of four elephants. As we pull into the sanctuary we are greeted by Tukta, Mr. Pop’s wife, cooking away in a small open kitchen area. The best Pad Thai lunch you will ever have is included in your day at the sanctuary. Walking around the corner, you are surrounded by rice paddies, a river, and beautiful mountains — the sanctuary lies on 18 acres of lush land. Everywhere you turn it’s green, full of life, and as open as if you were standing on top of your own mountain. And then there they are, three immense, wrinkly elephants roaming freely in this serene atmosphere. There are two adults and one baby elephant. After you realize that this is not a dream, clothes and shoes are offered to change into. (Getting intimate entails getting a bit dirty and wet.) Once changed, getting up close and personal with these massive elephants is a must. Mr. Pop introduces you to the elephants and takes pictures, making the surreal aspect of being so close to such an enormous, wise creature become more palpable. 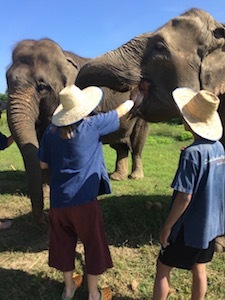 Then a schedule ensues and we are off to cut grass to feed the elephants as well as fulfill all the daily responsibilities of caring for them. This includes making and feeding them medicine, giving them mud baths, and cleaning up their sleeping areas (shoveling dung). If you are up for it, you will be waist deep in water, sloshing through knee-deep mud, cleaning the elephants. It is an experience like nothing else you have ever experienced and makes for good fun and interesting stories. 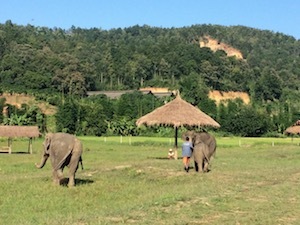 The Mahouts, or elephant caretakers (one is assigned to each elephant), participate with you and show you the way of their world. After a few hours of being a Mahout, showers are available and desired. Once clean and refreshed, lunch is served. As other people arrive for their intimate experience we are winding down and getting ready to leave. The energy among Mr. Pop and all those who help this sanctuary thrive is so positive. His calm demeanor has being a past monk written all over it. How lucky for the elephants that get to call this their home. There are a few different options for visiting the sanctuary. You can do a half day, either morning or afternoon, or a full day. We chose the morning half day, to beat the heat of the day. Humidity is a mere 91% in Chiang Mai. Whichever option you choose, I will be surprised if you leave disappointed.